What is Systems Management? 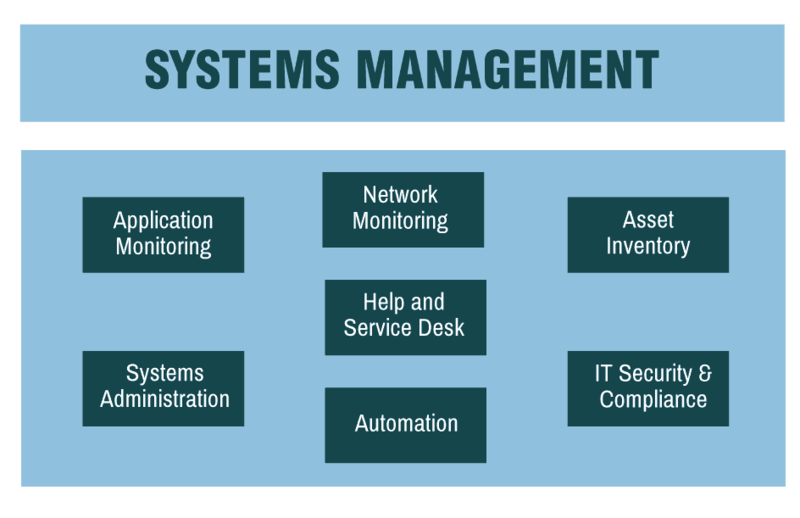 Systems management refers to the centralized administration of the IT (Information Technology) in an organization. The concept covers a broad set of subsystems that are needed to monitor and manage IT systems correctly. Managing IT systems is essential for organizing and running your business. Good system management is the backbone of an IT-based organization. When implemented effectively, it makes the delivery of IT much easier, making the employees adapt faster and be more productive. 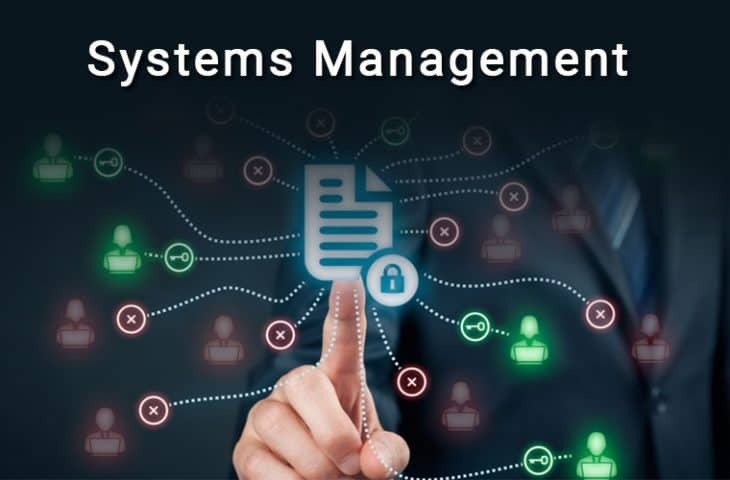 Why is Systems Management so Important in 2019? Expanding traditional IT systems create complex problems for the support staff, which in turn can waste their valuable time and efforts. This results in a lack of resources for capacity planning and performance improvement. Leaving your company without the potential for growth and technology adoption. Adopting emerging technologies in 2019 such as IoT, Edge Computing, or 5G will help your businesses scale exponentially. But when you do, your IT requirements will scale as well. It will become really important to monitor and protect all your assets and adapt to hyper-connectivity speeds. A single second of downtime can affect your business and cause a high loss. What Elements of IT Can Systems Management Help You With? The Application Performance Management (APM) is a subset of the Systems Management. It deals with the monitoring and management of the performance of applications. This subset helps detect complex problems, deals with life-cycles, and level of service. To keep a record of hardware or software assets. This subset helps in asset lifecycle management, keeps a record of hardware, including firmware, versions, OSs, and their licenses. For software asset inventorying, it keeps versioning, patching, and licenses in control. This subset helps manage the overall performance of the systems through log analyzing. It helps you collect, correlate, and analyze the system’s data to give you an insight into the performance. This includes monitoring of network devices, such as routers, switches, wireless access points, and end points. 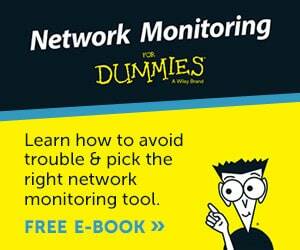 Network monitoring helps managers identify failures quickly and improve performance accordingly. Monitoring and management of servers, storage, databases, virtualization, cloud, printers, PCs, and mobiles. This subset gives you full administration over systems configuration and the disaster recovery and backups. Security information and event management. This task is in charge of running anti-virus and malware tools, intrusion detection, data loss, and prevention systems and helping with any regulatory compliance. This might include automated backups and restores, automated workloads, or desired configuration states. A network automation software can also give you insights into faults, performance, availability, bandwidth, and IP address management. Some benefits of this service are the ability to create and track issue tickets from a single place and have an IT expert solve them. IT teams can track issues, changes, and faulty assets. What are Some Challenges When Implementing Systems Management? The idea of a systems management tool is to keep your business systems running smooth and improve the employee’s productivity. But when it falls into the wrong hands, it is a different story. A systems management can sometimes make management more complex and less productive. It requires a learning process and some investment to make it work. Employees need the right training to use these tools effectively. Deploying and using centralized systems management require time and effort. This is related to the size of the business and the existing expertise of the IT staff. Implementing and maintaining an IT and systems management requires an increased cost. Some of the best tools on the market are not so cheap, and the free ones take time to install and learn. Many systems management software is able to integrate and operate with different hardware or software vendors. Unfortunately, all of them have different data interpretations, which makes the interoperability, challenging. How Can You Keep Your Systems Up and Running? Management tasks such as Server Updates, Service Desk Management, Network Performance Monitoring, can help your systems have high availability. According to the Global ICS & IIoT Risk Report from 2018, CyberX is finding unpatched Windows systems in more than 50% of all industrial sites. 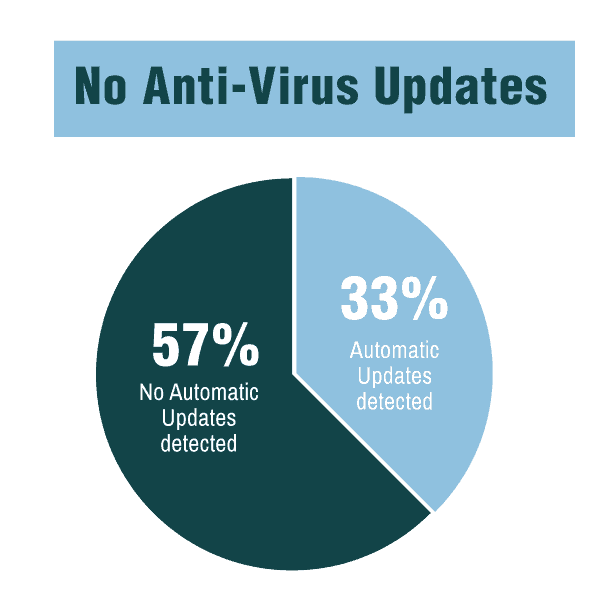 To make things worst, 57% are still not running anti-virus systems that update signatures automatically. Having software up to date, patched, and with latest Anti-Virus definitions is one of the most important aspects to avoid security breaches and reduce high CPU loads. The best systems management tools will help you centralize and automate patching and updates deployments. Another task is Service Desk Management solutions which can help you manage services remotely. You give control of your systems to IT experts that monitor 24/7 and manage all your patches and updates from a single place. Network Performance Monitoring is another subsystem designed to reduce network outages and improve performance. When a problem occurs, a network performance monitoring tool creates alarms based on user-defined conditions, parent/child dependencies, or network topology. What to do When Disaster Happens? “Everything fails all the time” — Werner Vogel, The Vice President & Chief Technology Officer at Amazon Web Services. Although AWS’ S3 service offers an amazing uptime percentage of “equal to or greater than 99.0% but less than 99.9%”, according to Vogel, all systems still fail. Sometimes a disaster is unavoidable. When it hits, there will be downtime and security breaches. But systems management help us react quickly, get back on our feet, and investigate the root cause of the issue. Whether it was a system malfunction, a compromised device, failure to perform a backup, a power outage, or a security breach, we can be reactive and solve the problem. An Intrusion Detection System can help identify the intrusion so you can stop it and implement an Incident Response Plan. At the same time, a Backup and Recovery System can help you recover all your data and configurations in case you were attacked by a Ransomware or the data got corrupted. A Disaster Recovery and Backup solution can keep your business safe. How to Plan When Getting a Centralized Systems Management? What are the current IT resources? What is the business size? What are the main requirements and limitations? What is the company’s budget? Answering these questions will allow the systems administrator to find the right software match. For example, if a small network with just a couple of devices needs a systems management, purchasing and deploying a tool will be more expensive and time-consuming, than just managing devices on their own. But if the company is large and depends on technology, it would be impossible to manage thousands of devices at the same time. Unfortunately, there is no universal tool to match every business criteria. Products vary in price, features, operability, etc. How to Find The Right Solution? Finding the right solution is a matter of identifying the pain points that your employees or you are experiencing on your systems. That could be traffic at certain hours, vulnerabilities, or devices consuming high resources. SolarWinds Systems Management Bundle for a Full Systems Management Solution! PRTG Network Monitor for IT infrastructure monitoring. ManageEngine Service Desk for IT Help Desk. 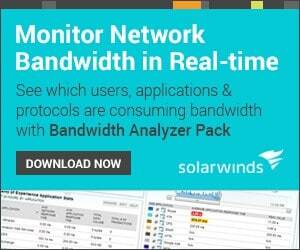 Patch Manager by Solarwinds for Patch Management. 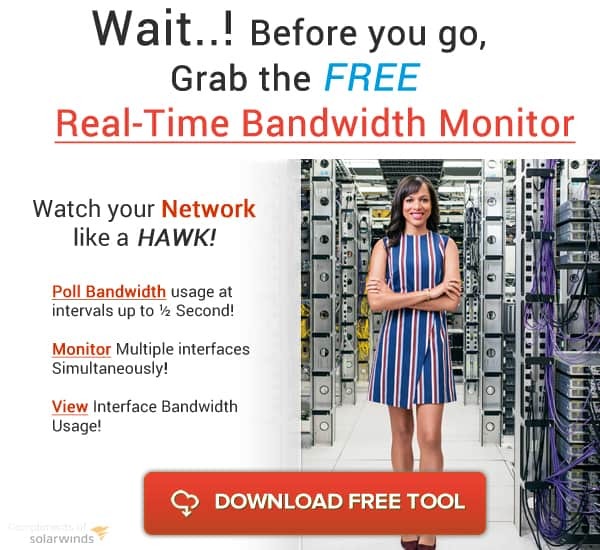 Solarwinds Offers a Great tool that is a 3-in-1 Tool that has 3 separate, complimentary software suites that integrate with each other to provide you with a Macro view of your enviornment and really help you keep Systems Management on lock down! A single second of downtime can affect your business, cause a high financial loss, and lower productivity of the employees. A Systems Management tool or software suite can help your IT environment to stay Online and run smooth. It is the most important element of an IT-based organization and your success! But finding the right Systems Management for your business should not be your second priority, but something that needs your full attention. There are many options on the market and if you know your organization from head to toe, and your business requirements, you’ll be able to find the right software match. But if you don’t have the time to hire IT specialists and purchase expensive software, you have the chance to hire an IT Help Desk and give them control of your systems management. The advice and support from these experts will be invaluable in the long run. See Full Bio & All Articles from this Author. 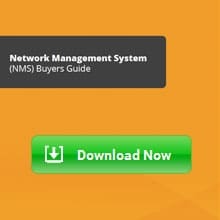 Having trouble choosing the right NMS for your network? Grab this White paper and evaluate your options along with specific needs for your environment. Learn how to use Deep packet analysis to discovery and monitor the way people access your servers and interfaces on a granular level. 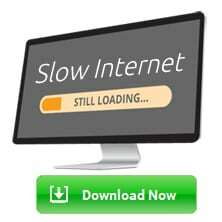 Network & Internet SLOW? Diagnose your Bandwidth Usage Today! Learn how to diagnose issues with slow internet connectivity, high bandwidth usage and more with this Free Whitepaper. 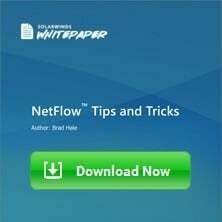 Latest Tips & Tricks for using Netflow! Check out these Simple ways to use Netflow in your network and get the most of our your switches and routers when collecting and analyzing data.